'A whiter shade of pale' is one of those songs that have been universally accepted as a true classic. The Hammond organ line was inspired by Johann Sebastian Bach's 'Sleepers awake' and 'Air on a G String', but contrary to popular belief, the song is not a direct copy or paraphrase of any music by Bach, although it makes clear references to both pieces. The song reached number 1 in several countries, including the UK and the Netherlands, when released in 1967. 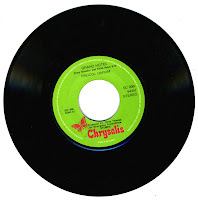 Written by Gary Brooker, Matthew Fisher and Keith Reid, the latter commented that he got the idea for the title when it came to him at a party, which gave him a starting point for the song. 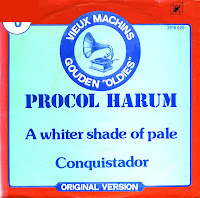 Procol Harum is best known for their classic single 'A whiter shade of pale', which has a notable classical influence. However, the band is also well known for incorporating blues and pop into their music. The group's members Gary Brooker and Robin Trower were always torn between these two styles, with Brooker's classical background and Trower's tendency towards blues material. When Trower left the band in 1971, Procol Harum tended more towards the classical side. This is evidenced well in this single from 1973: 'Grand hotel' combines a stately melody with a church choir and a rather bombastic orchestral backing. The single charted in the Netherlands and peaked at number 23.